Gosh! That is beautiful! I love watercolors. To have something made by her hands - what a treasure. How incredibly sweet and beautiful! That's wonderful to be able to open your box and have a beautiful painting by your mother to remember her by. Beautiful! It's amazing what memories we pull out at Christmas. They are precious. aw, it is beautiful! i would have a hard time putting that away! I have a tin, old and rusted but filled with precious memories. Oh, ELK, that is so beautiful. It is wonderful that you have things that your mom created and filled with love. ELK, you are such an inspiration to me. Please stop by my blog when you get a chance. I have something for you! This post really warms my heart.. I have a huge affinity for watercolors - to have a painting of your mother's as a sweet reminder... I pondered on it most of the day. Memories and mementos are such precious gifts, aren't they? To hold in your hands the beauty created by hers; such a wondrous thing. this is beautiful. 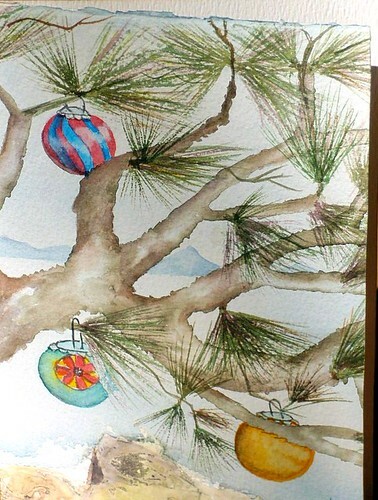 i have several hand-painted christmas cards from my mom too. they are certainly treasured. how fabulous that you have this....so beautiful !! What a beautiful painting and lovely treasure full of memories. wonderful watercolor! i love this medium of painting so much! this is beautiful and so very special - i know it brings you great pleasure and stirs the emotions. she is a wonderful artist. just lovely. How sweet, beautiful, precious and touching this postcard is! this brought a little twang of loss to my heart. i miss my mom. she loved the holidays. i'm sending warm and happy thoughts to you!